We have been supplying Melbourne’s top hotels, restaurants, cafes, delis, caterers and events since 1985. Our clients tell us what they love most is that we deliver a consistently high quality product, customise fillings and shapes to suit their diners and are constantly reinventing flavours to cater for changing seasons and palettes. For delivery in the Melbourne Metro area, we operate Monday to Friday. For delivery in regional Victoria or interstate, please contact us or refer to our stockists list. Every morning our pasta makers produce fresh pasta for many of Melbourne’s best cafes, restaurants, delicatessens, major events and catering companies. Years of knowledge, experience and understanding the requirements of the hospitality industry, has given Farinacci’s a respected and renown name in the industry. Our pasta is HACCP approved, undergoing heath department and third party auditing. 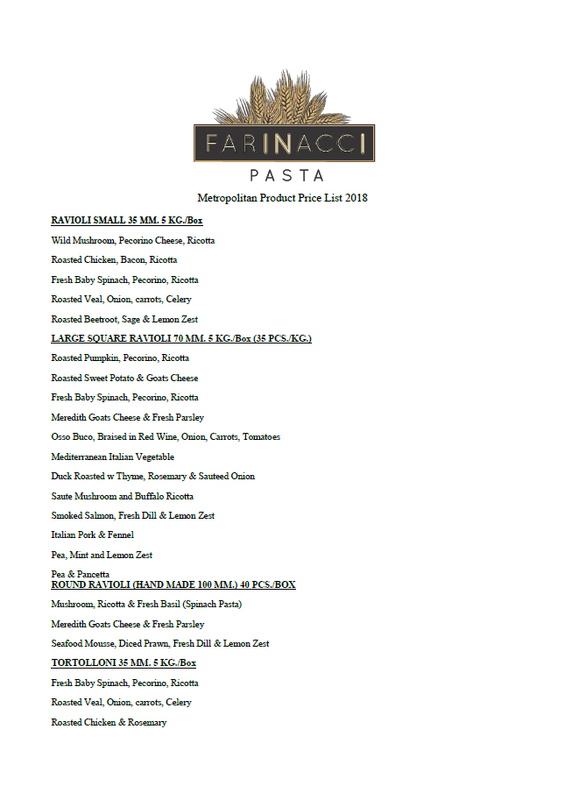 Farinacci Pasta is made from Australian Durum Wheat Semolina and Pasteurised Whole Fresh Eggs. These core ingredients form the excellence in taste and quality of our pasta. Our gluten free pasta and production method is HACCP approved. You can refer to our wholesale list to the right for our full range of fillings and shapes. Alternatively if you require a specific filling or handmade item please pop over to our contact page and get in touch with us for further information.